This menu for vegetarian, it’s easy for cooking and delicious. That is good idea for holiday with family. 1. Wash and stalk the strawberries, cut them in pieces. 2. Keep 6 entire strawberries for decoration. 3. Put them in a crusher, add the lemon juice and the sugar. Mash the mixture. 4. Mix with cream cheese. 5. Put into the freezer in a plastic box for 5 hours. 6. Get out the ice-cream 15 minutes before serving it in individual fruit dishes with the strawberries put aside. 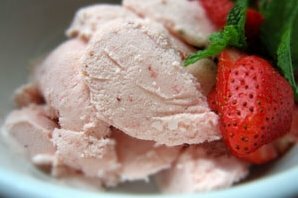 Enjoy your cooking for strawberries ice cream vegetarian.